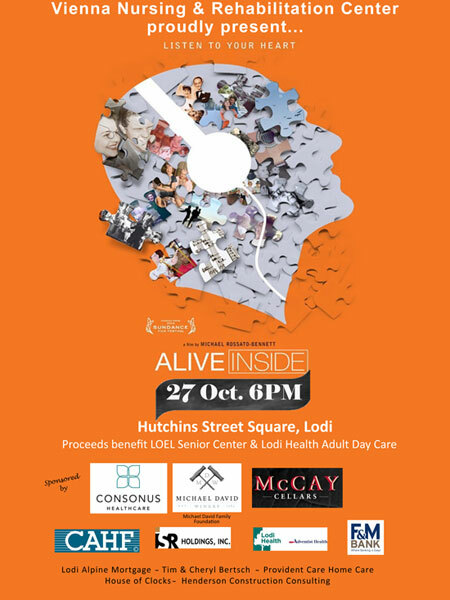 Vienna Nursing & Rehabilitation Center was proud to host a community screening of the documentary Alive Inside this fall to help bring awareness to the Music & Memory program that has been so successful at Vienna. In addition, Vienna donated $1,000 each to the LOEL Senior Center and Lodi Health Adult Day Care to fund the Music & Memory program at these facilities. We are thankful to the many sponsors and community members who supported the documentary screening. And we are gratified by the number of people who have come forward to support this program — including Lodi-area high school students who volunteer with our residents. Inspired by the documentary Alive Inside, Vienna began incorporating the Music & Memory program (depicted in the film) last spring as part of the care that families can receive at Vienna. The program was so successful, Vienna wanted to help spread the word. The Vienna staff has seen results that are nothing short of awe inspiring. We've experienced non-vocal residents who speak and sing, and other residents who are generally quiet and reserved, smile and break into song and dance. This program has taken residents who are constantly anxious and moved them into a happy, calm state, and helped to improve the relationships of many other residents with their families, friends and caregivers. The Music & Memory program benefits both patients and their families, specifically those struggling with Alzheimer’s, dementia, and other neurological disorders. Grounded in research about how the brain responds to music, the program can engage those who will have the opportunity to benefit from the therapeutic potential of music to tap deep memories and reconnect with the world. Vienna is not alone in the advocacy of this program. We are working with the California Association of Health Facilities to spread awareness about Music & Memory, and we also have the support of the Alzheimer’s Association. By incorporating LOEL Senior Center and Lodi Health Adult Day Care, we have the opportunity to reach many local families who may not have otherwise been able to benefit.